After spending the winter getting all our cycle gear together we had to figure out a way to get the bikes to our starting point in London, England. 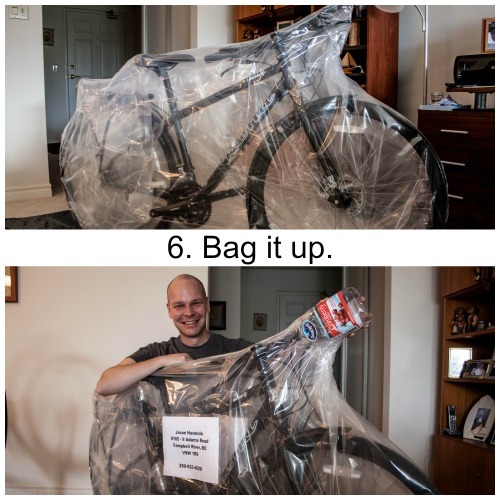 There are basically two methods of shipping a bike; breaking it down and boxing it up, or sliding it into a bag. After researching both methods, and weighing the pros and the cons of each, we decided to go with the bagging method. Not only does it require less taking apart of the bike but there is a theory that if baggage handlers can see that it’s a bike then they will be more careful with it – plus they can’t be stacked like when they are in a box. You can use any heavy duty plastic bag – it’s finding one that’s big enough that is the tough part. We found these at Wiggle.com and had them sent to us. They are quite a thick polyurethane and stand up well to baggage handling. Packing them up turned out to be pretty easy. Protect the derailleur. 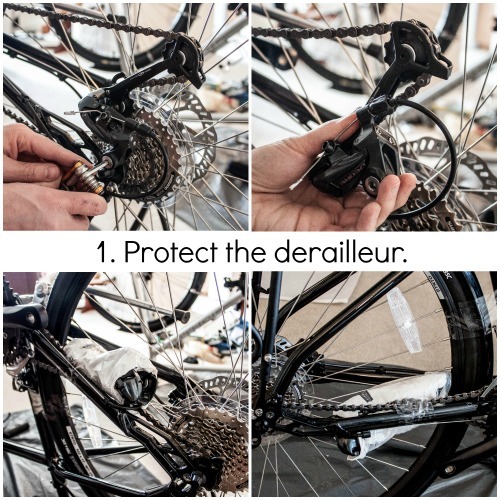 This isn’t a necessary step but we know from experience that derailleur hangers are easily bent and a bent derailleur can quickly derail a good day. :) It’s held on with just one bolt so comes off really easily. We then just wrapped it in bubble wrap and taped it to the frame for safe keeping. Turn the handlebars. 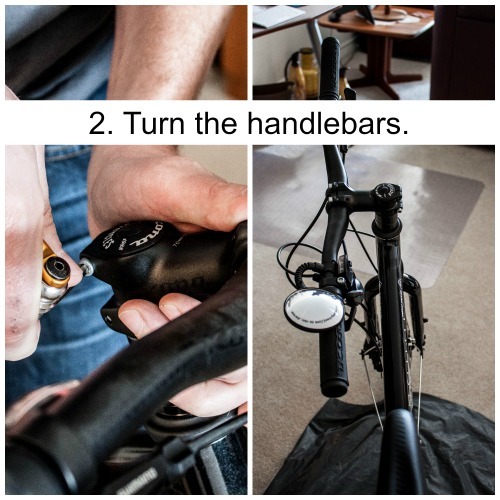 Simply loosen the headset and turn the handlebars for a narrower profile. We also turned them under to protect them just a little more. 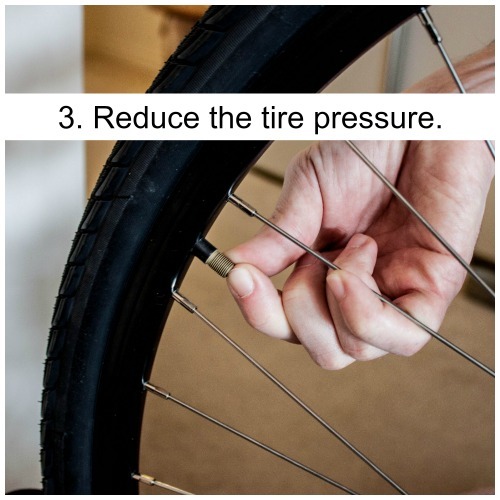 Reduce the tire pressure. This is an airline requirement. They don’t have to be flat – just take out enough air to allow for expansion in different air pressure environments. Secure the front wheel. 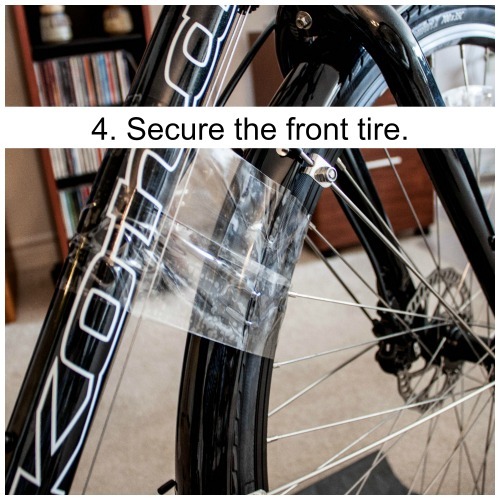 We taped the front tire to the frame just to stop it from wiggling about too much and make it a little easier to handle. Remove the pedals. 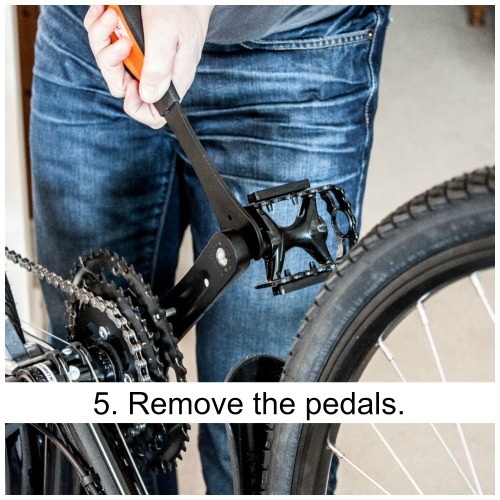 Use a pedal wrench to remove the pedals so they don’t stick out through the plastic bag. The bikes have taken one flight since being packed up and they survived quite well. All we need to do for our upcoming flight to London (tomorrow!!) is check on the taping and switch out the address label to our London destination. What a grand adventure you’re off to have.I bet you have a great time. 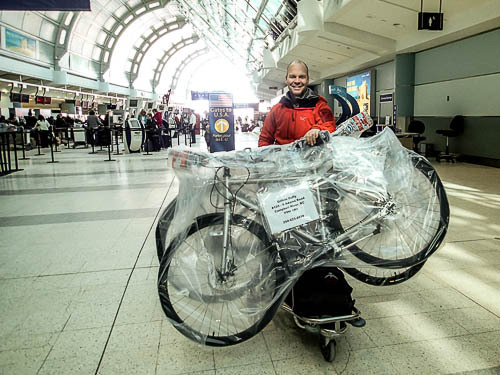 I shipped a bike from Vancouver through to Dar Es Salaam, Tanzania via London and it arrived in one piece. The box was jammed with stuff as well but no problems as all. I wish you the same good luck I had. Thanks so much Leigh -we’re pretty excited! I can NOT imagine having to do this! I hope they make it across the pond in one piece. Looking forward to hearing about your cycling trip! Ali recently posted..Should We Expect People in Other Countries to Speak English? It really wasn’t that hard Ali – I hope they make it too! I recently brought my bike to Thailand from Dubai. The most challenging bit was navigating a luggage trolley with it on! I took it into a bike shop in Dubai and they took it apart and boxed it up then I did the same in Thailand. I didn’t have the time, tool or know how to do it myself so well done you two! I think that is the hardest part Candice! We’re travelling pretty heavy right now and wrangling it all it proving to be a challenge! Arti recently posted..Things to do in Melbourne, Australia: Fitzroy Gardens, Captain Cook’s Cottage, etc. More riding less writing! ;-) Have an awesome adventure!